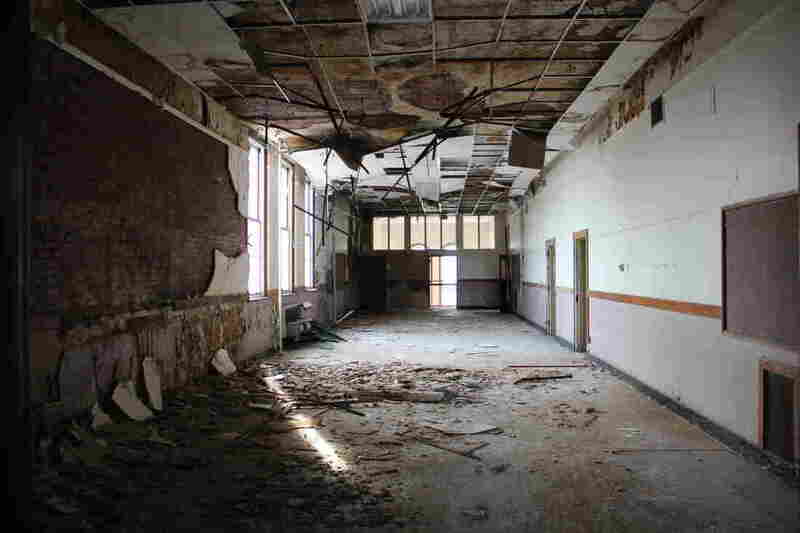 The Struggle To Breathe Life Back Into Empty Schools : NPR Ed As urban schools across the country continue to lose students, the question districts like St. Louis face is: What to do with all of those empty buildings? Eliot Elementary in St. Louis, Mo., closed 10 years ago. The building remains empty. Virginia Savage lives in a part of north St. Louis, Mo., that's filled with vacant buildings, including Marshall Elementary. It has been closed for years now, and vines crawl into the building's smashed-out windows. The playground is littered with empty liquor bottles. Savage went to school at Marshall as a young girl, and now she sees bigger problems beyond all those blemishes: "Drug dealers, drug users, eyesore. That's what I see." In St. Louis, the student enrollment is one-fourth the size it was in the 1960s. That drop has led the district to close 30 or so schools. It's the same story across the country in cities like Atlanta, Detroit and Chicago, where district leaders are facing the big question — what to do with all of those empty schools? Savage volunteers at a neighborhood church that used to be a vacant school, too. So she doesn't just see problems, she also sees potential. "Apartments, room for the homeless, a community center," she says. "There's a lot that can go on with this building." Empty buildings are difficult to secure, they can attract crime, and they fall apart quickly. So St. Louis Public Schools rounded up a group of volunteer architects, contractors and community health experts to pitch developers and lure investors into doing something with these places. And because this all boils down to real estate, the first thing to do was throw a bunch of open houses at schools like Eliot Elementary, another stately historic school. It's more than 100 years old and classic St. Louis with an impressive stature, deep red brick and thick, wrought iron. It probably sounds like a steal at $260,000, but it's also what you might call an ultimate fixer-upper. The school closed 10 years ago, and inside, insulation is scattered across the floor. The sub-ceiling is down, paint is stripped off the walls, all the copper is out of the building and the alarm system has been ripped out. It looks like the set from a post-apocalyptic film. "Post-something," says Walker Gaffney, director of real estate for St. Louis Public Schools. "Post-population flight, post-declining enrollment and diminishing resources." It might seem logical to just tear the place down, but Gaffney says that wouldn't be a good use of money. "The cost of tearing this buildings down is very prohibitive — anywhere from a half million dollars up to a million," Gaffney says. "This was a temple of learning that was built to last hundreds and hundreds of years." That's learning that many say could continue with one obvious group of potential buyers: charter public schools, which have seen increasing enrollment. The district used to have a rule against selling empty schools to charters, but that's no longer the case. Yet some in the charter community say St. Louis Public Schools is still rejecting their offers. 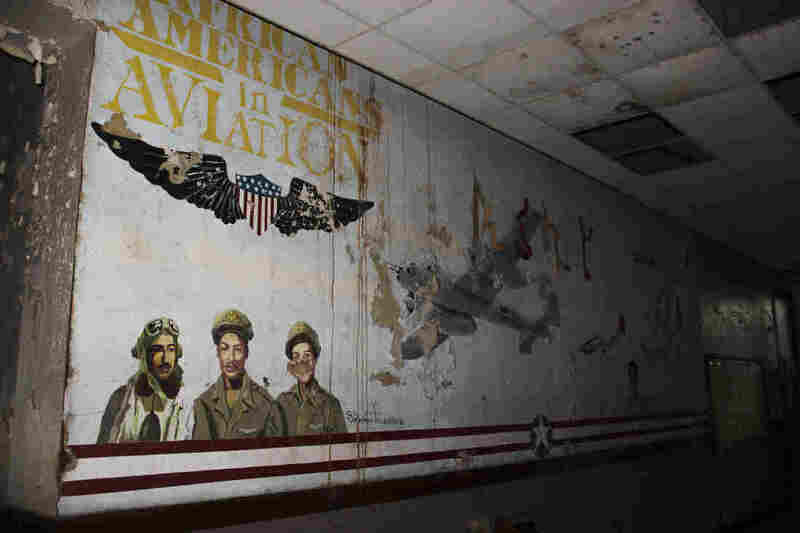 The Eliot building is falling apart, but hints of the past still line the surface — like this old mural visible through the peeling paint. Gaffney says there's no unwritten rule against charters and it's all about competitive offers. "Now, is the district going to give buildings away?" Gaffney asks. "No. This is the list price; make me an offer." So far the district's plan to lure investors has been working. A few deals are in the works to renovate old schools into apartments, offices and artist spaces. But there's still much more work to be done. Jessica Eiland is another community member tasked with finding investors. She runs Northside Community Housing Inc., a nonprofit that builds homes in the area around Marshall Elementary in north St. Louis. And while she acknowledges it can be a huge challenge to breathe life back into these buildings, she also says redeveloping a 50,000-square-foot vacant school like Marshall could have a domino effect. "It could be the catalyst to get other people thinking, 'You know what, I should invest my resources on this side of the community.' "
Because the last thing any school was meant to do is bring problems into a neighborhood.